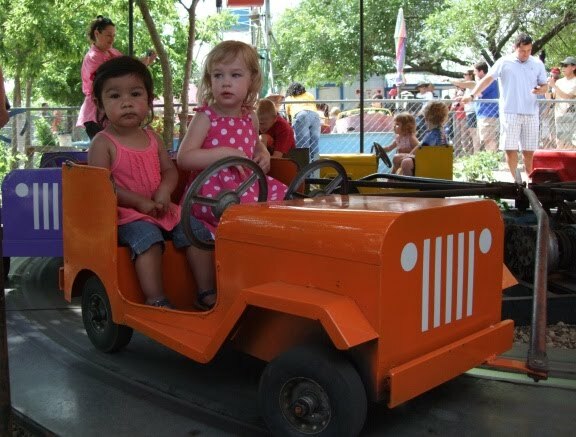 We took Alice to Kiddie Acres this morning for her first trip to an amusement park. We met our friend Tavo there, and he brought his daughter Izzy. 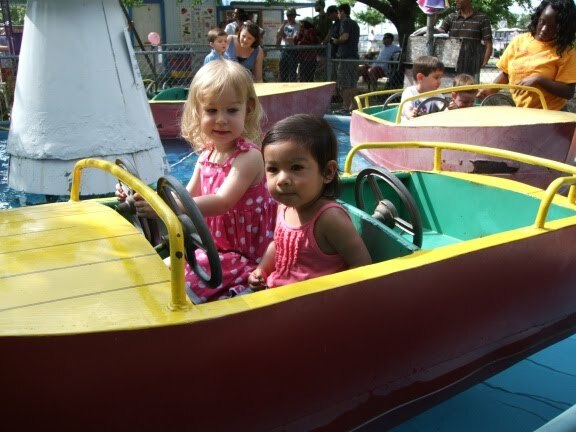 Alice chose to ride the boats first. She was very good at staying in her seat, and she enjoyed dipping her hand in the water. She enjoyed this ride the most, and asked to ride it two more times. Second, the girls rode the Jeeps. 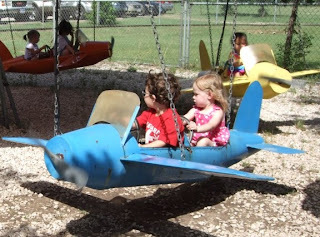 As Larry has pointed out, all the ride look much better in the photos than they did in real life, but the girls thought they were fun anyways. Third, was Alice's first pony ride. The attendant took Alice's ticket and asked if she could pick her up to take her to the horse, and to our AMAZEMENT....she said yes, and outstretched her arms. 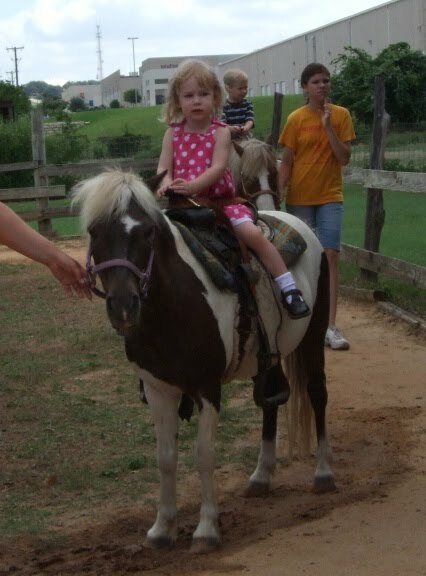 I guess anyone with a pony is alright in Alice's book. 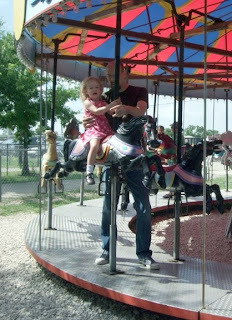 Next, Alice and Daddy rode the carousel. 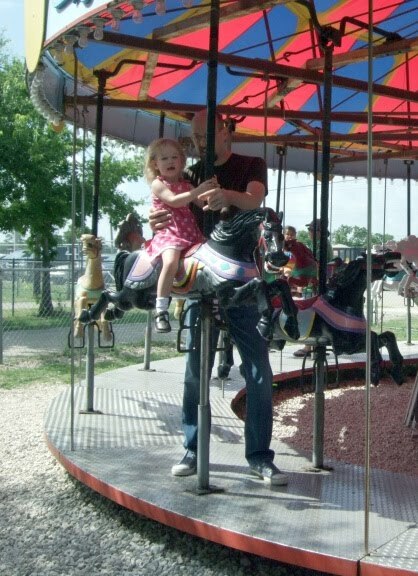 Alice is a pro at the carousel, since Didi has taken her to one a couple of times before, but it was her first ride with her dad, which makes it special. After the carousel, Alice rode the planes. We think this was her least favorite, since she had a concerned look on her face the entire time she was on the ride, but she sat still and soaked it all in. 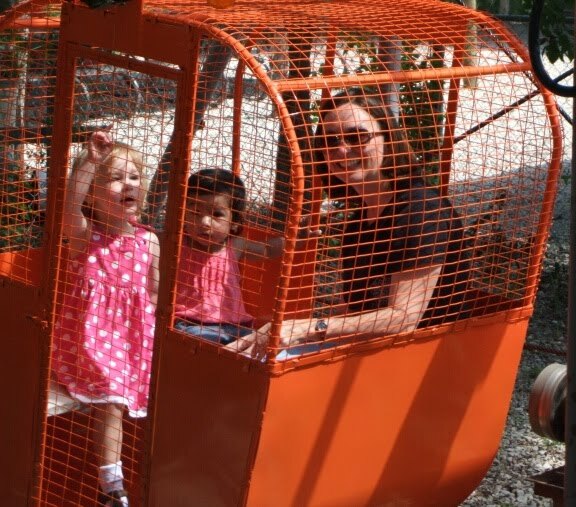 Mom took Alice and Izzy up on the Ferris Wheel. Luckily there was a 200 lb maximum weight limit, and the girls aren't that heavy yet ;-) Alice liked it when the ride stopped us at the top and we could see over the trees. Alice noticed we were "really really high". We were there for only 1 hour, but it was an action packed hour, and we were all already tired. and she wore her favorite dress too. Oh happy day!